New York City is one of my favorite cities, and I love reading books about her. Despite having lived there for a year, there was so much I didn't get to see, mainly because I was working full-time and only had a limited amount of time for exploring. Fortunately, there seems to be an endless amount of books on the city, especially coffee table-type books, so I get to play catch-up whenever I feel the need. This is a city that continuously reinvents itself, so if you've not been there in a decade, be prepared for changes, many are often subtle changes, on your next visit. I love the way this book shows how things used to be versus how they are now. Fortunately, much of the old New York has been kept, but sadly, a lot was demolished in the name of progress. We're taken on an historical journey where we get to see what Battery Park City looked like back in the day (along with a little history to ponder), the John Street Church, Chinatown, Little Italy, the Empire State Building, the New York Public Library (not to be missed), Herald Square, Central Park, Harlem, and the fascinating bridges. There are snatches here and there of interesting facts about this magnificent and alluring city. There are other books is this series, on Boston, Chicago, and Washington DC. 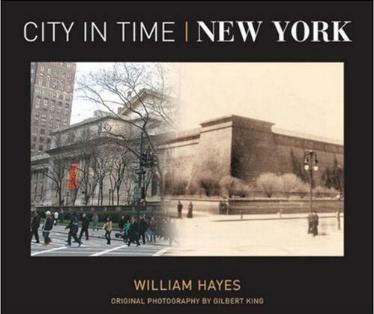 Conclusion - A must-have keepsake of a memorable city.